When travelling in the UK with your pet you may wish to visit one of the many tourist attractions that abound in this beautiful country. There are many stately homes and castles in the United Kingdom and to visit one on a sunny summer’s day can be delightful. However most of them do not allow pets to accompany their owners inside the buildings. In fact most do not even allow dogs into the gardens. As many of these places now have websites to promote their establishments it is well worth checking out facilities for pets before you sent out on your journey. The only pets allowed in the houses, shops and restaurants are assistant dogs with their owners. There is limited access to other dogs in some parts of the ground where a dog symbol is shown. Dogs should be well behaved and on a lead at all times. It is becoming more common for dogs to be banned from beaches during the summer months. With the introduction of the pet travel scheme and the opportunity for overseas visitors to be able to bring their pets to the UK it is a shame that they cannot enjoy the many beaches in this country. Most people control their dogs and pick up after them. It is the few who unfortunately have spoilt it for the decent dog owners. There again a spring or autumn trip to the beach will find it almost empty and void of children who will be in school. Again in many towns dogs have been banned from entering public parks and gardens. When travelling with your dog it is advisable to be aware of the local bylaws that affect your pet. If you do not pick up after your dog or let him run off lead you are liable to a hefty fine. Most theme parks only allow assistance dogs onto their property. There again would you want to take your pet into a noisy crowded place when he could be left at home? If you are on holiday and wish to visit a theme park you may have to leave your dog in your car. Try to find a quiet place in the car park where there is shade. Some attractions have a special area for pet owners. Remember that the car can still get very hot even in the shade so check on your pet as often as possible and give him a chance to stretch his legs and have a drink of water. If you intend to visit a lot of places that do now welcome pets perhaps you could put him into a kennel for several days of your holiday, he will probably enjoy the break and you will not have to worry about his comfort during that time. If you have children they will most likely want to spend time in playgrounds and adventure areas. Dogs will never be allowed in these places and it could be a lonely time for your pet while everyone else is having fun. Perhaps one member of the family could walk your pet while the other supervises the children. Making compromises means that everyone can have a good holiday. There are places where well behaved pets are always welcome – the open spaces in the countryside. 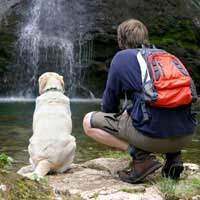 By obeying the countryside code and taking care when hill walking your pet can enjoy his holiday as much as his owners.